This post is not about Québec separatism. At least, not about the traditional kind, i.e. Francophones and their lurid dreams of elevating the province to country-level. Recently, I have been introduced to another kind of separatism, one that brings the saying of the deux solitudes to life. It was right there before my eyes, in Montréal. 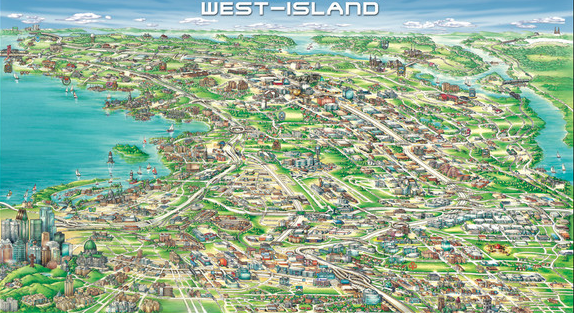 But for the first five years of my time on the island, I had no reason to spend time on its western tip, in the well-heeled suburbia collectively called the West Island. Even Francophones call it le West Island, and they might as well refer to a foreign country - one that has nothing in common with the rest of the province. Thanks to her extended family, many parts of which live in any of the towns such as Beaconsfield, Dollard-des-Ormeaux ("DDO" for its residents), Dorval or even Sainte-Anne-de-Bellevue (Ste-Anne-de-Banlieue, as my recent Swiss visitor immediately named it), I have at last discovered Planet West Island. What I found was a self-contained sphere, populated seemingly by 100% Anglophones, who are oblivious and immune to the multicultural metropolis that happens to share "their" island. Having visited on a few occasions this summer, I got the impression that West Islanders only leave their planet to head over the bridge to adjoining Ontario, or to hit the airport (located at the border between the West Island and the city) and fly away to the States. Endless streets of houses, all-English schools, big box stores and malls, and a plethora of uninspired, pseudo-fancy restaurants (with big parking lots) define this lifestyle. West Islanders seem perfectly content, unaware (and somewhat afraid) of the diversity, excitement and cultural riches of downtown Montréal, a mere 30min drive away. The disinterest is mutual, as evidenced by this snooty blog post. Very few Montréalais spend much time in the West Island, and when they do, they typically talk about it the same way they speak about dentist appointments - unpleasant, but inevitable. And even fewer people move between the two spheres. She, fortunately, is an exception. Perhaps because she was originally from the countryside, she managed to ultimately escape the gravity of Planet West Island. Now firmly landed downtown, she has no interest of ever going back to live there. She does, however, get a kick out of returning to the West Island every now and then to see what she has left behind. And I was glad to be taken along: I had not been to a zoo in a long time.